It's day 15 after an excruciatingly long beginning to the summer, but I say that every year. Shelli and Becky are the co-HOHs and it should be an easy week with the house having their eyes on eliminating one person. That easy target is Audrey, who has been planting lies for the first two weeks that caught up to her fast. One big lie Audrey started is that Vanessa was masterminding an all girl alliance, and this info was relayed to Vanessa and put the blame onDa'Vonne. After Vanessa addressed this rumor in front of both Audrey and Da'Vonne, Da'Vonne is livid and assembles a house meeting to out Audrey's 5am meeting and the lies she creates to instigate conflict. Audrey is in post-HOH comp hiding, realizing she's totally screwed from overgaming but in better shape since her friend Shelli is HOH. With Audrey the target, that means all the nominees this week will be pawns with a backdoor plan. Becky begins seeking out pawns to nominate, basically telling everyone the plan is Audrey so just keep it on the DL. 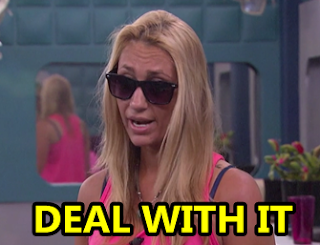 Thing is, Shelli (and Clay) don't trust Da'Vonne (Da' AKA Mama Da') and Audrey is "too easy" for them. Shelli wants to nominate Da'Vonne and a pawn to throw the Battle of the Block, enlisting Doctor John the Dentist to be said pawn yet again. He's half on board for but also wondering why he has to be the Big Brother house's weekly pawn. The nomination ceremony happens and as expected Shelli nominates John and Da'Vonne, then Becky nominates Jason and Steve. Becky reassures Jason and Steve that Shelli is in on the plan, but Jason and Da'Vonne know better that Shelli is coming for them. Oh and BTW, a year ago Becky was hit by a train. A freaking train! She put her head out past a van and the front of a train hit her in the face with severe injuries, like REAL severe, yet healed with no plastic surgery. The Battle of the Block has the competitors being camera operators for the hot mess of a movie "Ginger Fever" again. A shot list is playing on one screen like "gumball machine" or "Dr. Squirrel" (yay! ), then the two pairs adjust the camera angles to make those shots in the bedroom set laid out in the backyard. But what's a Big Brother competition without some goofy twist, so the pairs are put into a joint shirt and pants, perfect for a pair of conjoined twins. John doesn't have to throw the competition too hard since Da' makes the initial wrong mistake of turning on all the cameras first, instead of just a couple at a time to understand which cameras are active. Jason and Steve took the latter approach and that helps them win the BotB. Looks like Shelli's masterplan might work out as Da'Vonne remains nominated. Not Mama Da'! Becky is kind of happy she was dethroned because she made friends and Shelli is left to do the dirty work. But Shelli isn't getting rid of Audrey, but Audrey is unaware and panicked since no one talks game to her after being caught at the house's crappiest liar. Eventually Clay rolls out of spooning with Shelli in the HOH bed to tell Audrey the bigger plan that Da' is the target, not her. 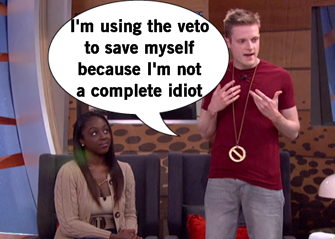 Da' begins to comprehend how incredibly screwed she is and that the veto is dire to her game survival. Shelli, John, Da'Vonne, Clay (Shelli's choice), Meg, Steve are selected to play in this week's "High Maintenance" Power of Veto competition. 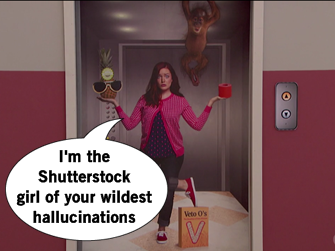 The rules are to find an item missing from Kathy Griffin's assistant's list, which they identify from a corny stock photo of an overwhelmed assistant. Because Kathy always leaves behind her fire extinguisher, giant Slinkie, and comically large bottle of champagne. What makes this cutthroat is that it's head-to-head, meaning the houseguests have to pick a person to compete against and eliminate. Right away, John knocks out Da'Vonne so yeah, she's screwed. But when John wins the veto she sees it as a possible saving grace, as John will save himself from elimination and hopefully Audrey will go on the block. A replacement nominee will have to be picked and Shelli decides it's time to let Becky know the target has changed from the original agreement. Becky should be a little more annoyed since there's a good chance Audrey will find out she was Becky's target, but Becky smiles and walks away. But those idiots in charge (Shelli and Clay) try to urge John to not use the veto and guarantee safety. Since he's not a complete moron like Clay is, John obviously plans to decline this terrible idea. Clay's reign of stupidity includes also being a piece of condescending garbage to Audrey to that he like runs everything and he's the sole reason she's being saved. Running out of pawn ideas, Shelli tells Liz she'll be the pawn which sends her downstairs crying to Becky and Austin. To save his ally, Austin spins a lie that Meg is involved with a large plan with Da' to take down Clay and Shelli. Plus Meg's a great pawn because she's well-liked and no one would vote her out. And so when the nomination ceremony happens, John saves himself (DUH) and Meg takes his spot as the other nominee. Meg cries about being the pawn that will evict her friend Da'. Shelli cries that she has to be the person to do the dirty deed of sending Da' home. And Da' just hopes a miracle saves her. Cue that horrendous BB Takeover music! A big red phone booth gets dropped into the living room and Kathy Griffin explains there are 15 phone calls coming, but one of those phone calls will have the twist to nix three votes come eviction this week. So everyone starts answering the phone and all we care about is call #7, the winning call. "Seven's my lucky number," Clay says because it's literally everyone's cliche lucky number including Da'. Da' is the one who gets that seventh phone call and the power of the Last Laugh, keeping her cool by suppressing the news before dancing happily in the storage room. Now Da' can nix three votes and has to get five on her side to save her, immediately campaigning. With a happier mood than usual, Clay and Shelli suspect Da' could have the power and might screw up all their plans. At the live eviction, Julie Chen reveals the houseguests that don't get to vote (but doesn't name who had the power). Becky, Jeff, and Jackie are removed from this week's vote and then the rest of the house votes. Jason and Audrey (!) vote to save Da'Vonne, but the rest of the house evict her. 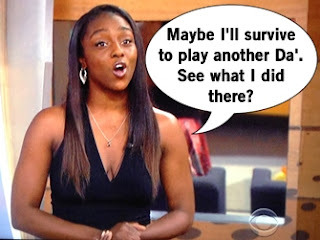 Eliminated from the game, Da' acknowledges she used her twin twist knowledge not to her best advantage but also wouldn't change the way she played if she could play again. Most interesting, she feels like no houseguest wants to be the person who nominates and eliminates the first transgender houseguest on the show and believes Audrey will sail through the game and win. We'll have to wait and see. Just know, I'm very bummed to see Da'Vonne leave. The BB Takeover music plays and New England Patriots star Rob Gronkowski appears on the TV screen, because apparently he's too good to make an in person appearance. Given his lunkhead status, it's no surprise he suggests a "party all week" which removes Have Nots and encourages winning. 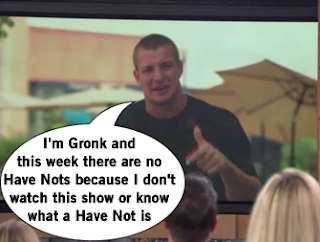 The Head of Household competition is "Gronk Pong" which is to launch balls into giant solo cups that are numbered (blue cups are the highest numbers, red are lower). Would've preferred to see a fly Jazz Cup because I like to live a fancier life. Austin gets the highest score with 28, then Liz, James, and Vanessa end up in a three-way tie at 23. The three head to a tie-breaker round and a 52 wins it for Vanessa. Vanessa has made a lot of allies so this could be a mess in a good way, but mostly I foresee a week of Clay/Shelli getting by and that disappoints me. But who knows, expect the unexpected?